One for the style purists today: a typical Southern English IPA. 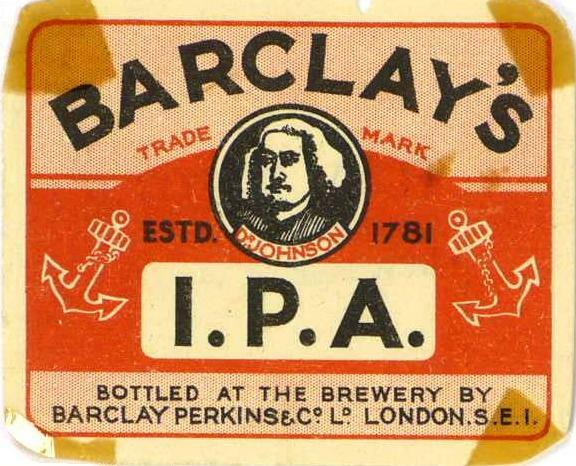 Just a few months before WW II kicked off, in June 1939, this Barclay’s IPA rolled out of the Park Street Brewery. Well, probably not roll, more clink out. It was an exclusively bottled beer. IPA (bottling) as it appear on the records, was apparently quite a new beer, only appearing in the early 1930s. A revved up version of the older XLK (bottling), which had an OG of 1039º. The two, obviously, were parti-gyled together. The recipe for Barclay’s Perkins Pale Ales hadn’t changed much since the mid-1920s. Pale malt, PA malt, flaked maize and invert sugar. Originally No. 2, but sometime after 1936 that changed to No. 3. Along with the caramel, it makes for quite a dark beer. Darker than it should be. The log gives the colour as 10. The hopping is reasonable, with mostly hops from the most recent season. The third from the 1937 season had been kept in a cold store, so wouldn’t have deteriorated much. Barclay Perkins usually dry-hopped their Pale Ales, except those intended for bottling. Sad to think this is the precursor to watery post-war Light Ale. I know recipes for the same beer can vary in the same year, but this recipe seems extremely different compared to other iterations you posted this year (March 14 and June 13). This version basically flips the percentage of flaked maize and invert included in the recipe, and the invert in this version is No. 3 versus No. 2 in the earlier recipes. These differences seem very significant (especially going from ~7.5% No. 2 Invert to ~15.5% No. 3 Invert) where they would be completely different beers, as opposed to the small differences between the iterations you posted in March and June. Any other details you can provide on why the huge difference in recipes? What time of year were these three recipes brewed? Oh yeah, and the Whitbread wy1099 yeast for this versus the WY1318 Boddington's?!? this isn't the same beer as those other recipes. They were Boddington IPA. This is Barclay Perkins. Wow, thanks Ron!!! I couldn't see the forest for the trees! I was preparing to brew the Boddingtion's 1939 IPA when you posted this and I had that recipe on the brain when I saw the post-- which gave me pause on what I was brewing wondering if I had transcribed the recipes wrong in the first place! That said, now I really want to brew this one and do a side by side with the Boddingtons-- two very different drinking experiences (I would think) of an IPA from 1939!